Measuring over 13 in. opened this is the big boy of Stiletto style knives! Steel handle core & bolsters w/ synthetic side panels. Seat belt and cord cutter. 13 1/4 in. overall opened, 6 1/4 in. 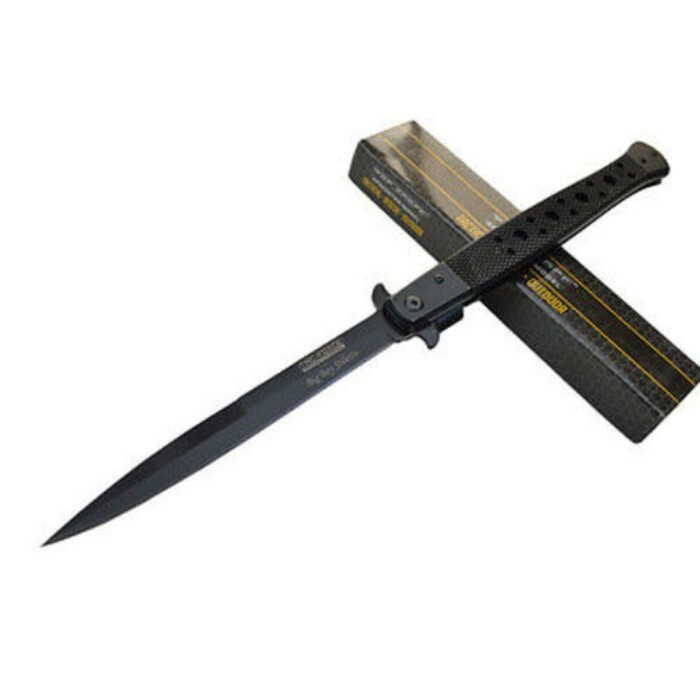 blade, 7 in. closed. 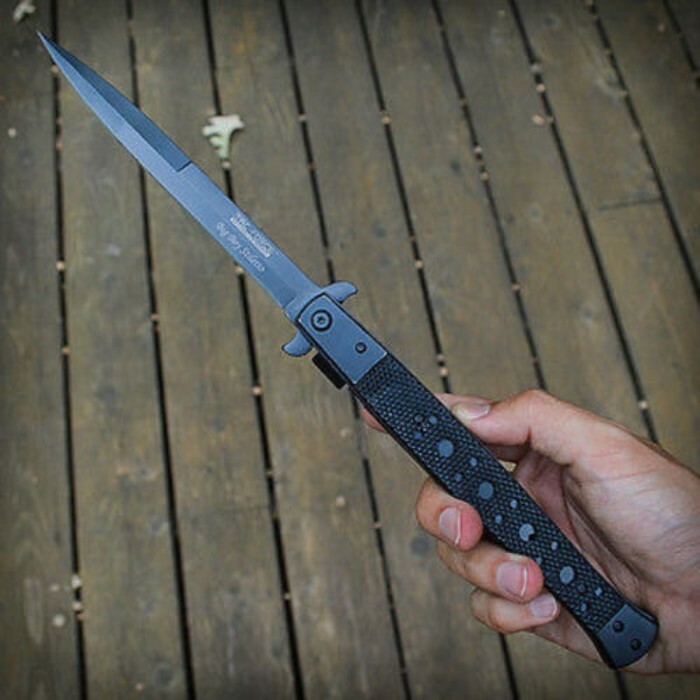 Stronger than some similar knives from other brands, big enough to intimidate, very sharp for slashing or stabbing. 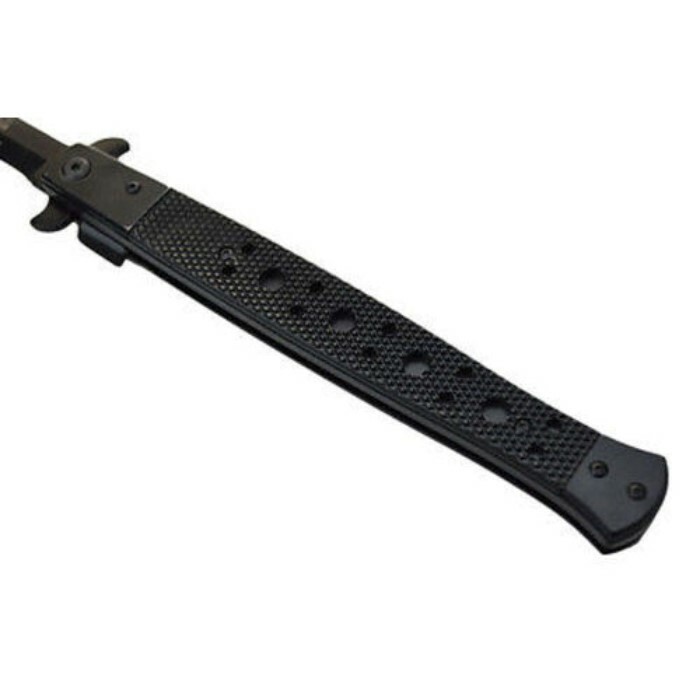 This knife opens instantly and the blade locks positively into place. AND it still can be relatively unobtrusive in your pocket! Be aware this is not designed to be a daily use tool. You should not be slicing meat with it, stripping wire, cutting Sheetrock. It is not designed to do those things. It is exclusively a self defense weapon. When I ordered this, I didn't realize just how large it really is. As I often do, I purchased just one to see how it would perform as a seller. When it arrived, I unboxed it and immediately thought 'dang, this thing huge, nobody will ever buy it' due to its length being in the novelty range. But not only did it sell immediately at the first show I had it at, the guy who bought it was walking around showing it to people and I actually received more orders for it. 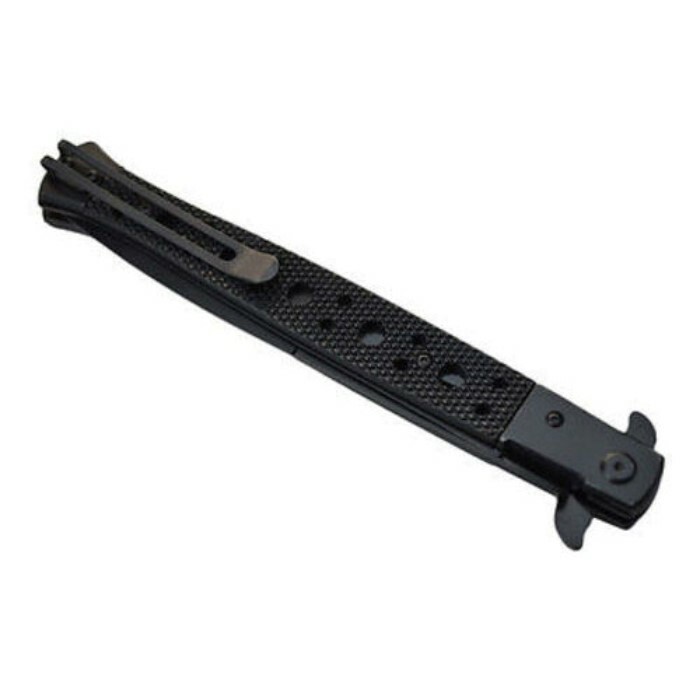 Technically, the blade appears to be good quality and is pretty sharp, and the spring action is fast and positive, which is saying something for a blade with that much leverage. This is an awesome knife for the price. Very well made, and it opens very easily. Definitely worth every penny. Like many people I ordered this knowing it was 13 inches, but seeing and holding are two different things! Its amazingly built, and was semi difficult to open at first but after hours of messing with it, (I just couldnt put it down) it opens easily and I am quite happy with my purchase, and I'm once again happy with TrueSwords shipping speed, shipped same day and arrived 2 days later, keep up the amazing work TrueSwords! Very heavy and sturdy. I've had it for about a month now and it opens smoothly for the most part. You have to be careful the vanity screws want to come out but if you put a little dot of super glue in there and tighten them they won't go anywhere. But for $12 you can't beat it. If you pull this thing out on someone they better either have a gun or be able to run really fast because this thing is a beast. People were having a hard time opening it but once you do it a few times it becomes really easy. If you're thinking about it, buy it. You won't be disappointed. 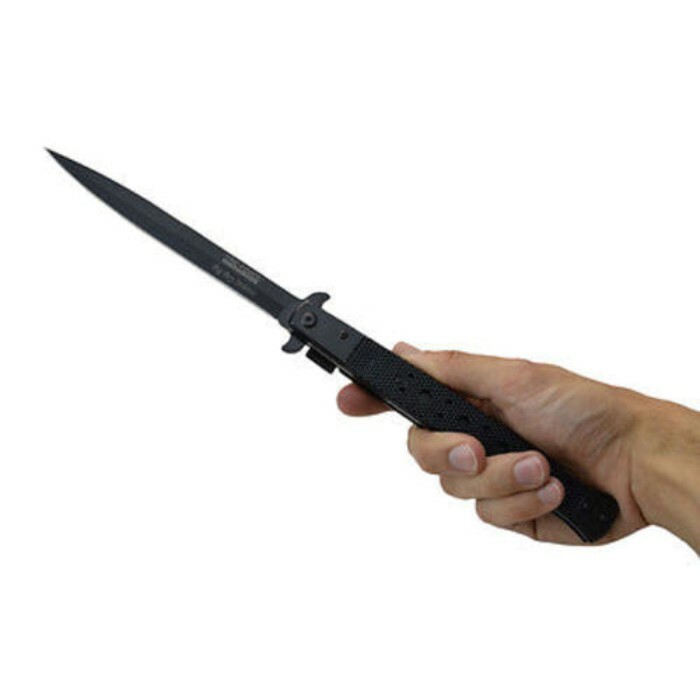 I baught this knife knowing it was going to be a 13 inch knife, but however If you want something you would be able to carry around without getting in trouble I would suggest buying the regular sized Spring assist Stiletto. Very good for the price! Fast delivery! Looks great!